The ResponseCard SE has a range of 200 feet. 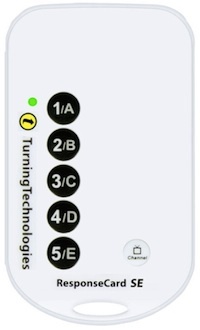 Turning Technologies has debuted a new classroom clicker with a price point of $9.95 per unit. The clicker, called the ResponseCard SE, is not designed for longevity, however. As Turning Tech described it, "While the keypad utilizes the same, reliable radio frequency technology as other ResponseCards, it has been reengineered to incorporate major cost reductions that ensure reliability while shortening its usable lifespan." That lifespan is about 10 days, meaning it's not for use in regular teaching environments. Rather, it's designed for use in special events, after which the devices can be discarded or returned to Turning Technologies, where they will be recycled. "Response technology was first implemented in meeting and event settings. Speakers experienced first-hand the benefit of incorporating an interactive component and collecting real-time feedback during presentations. ResponseCard SE is the most reliable and scalable offering available for the events market," said Turning Technologies' CEO Mike Broderick in a prepared statement. "It's a cost-effective, easy-to-use solution for situations in which the devices will be used during one event of up to 10 days while having the same reliability and durability as the ResponseCards our users have come to expect. In keeping with our commitment to environmental responsibility, we also offer all users the ability to return the devices for proper recycling." The ResponseCard SE is available now. Additional details can be found on Turning Tech's site.